For asparagus, snap off tough ends of spears where they naturally give when bent. Place spears into a pan filled with one inch of boiling water. Cover the pan and cook asparagus for 3-4 minutes, until spears are just tender but remain bright green in color. Drain and cold shock the spears in a colander under cool water. Return cooked asparagus to pan and coat with lemon juice and a drizzle of EVOO. Remove bundles of 2-3 spears at a time from the pan and wrap with sliced prosciutto. Pile assembled bundles on a serving plate. In Recipes-list.com we have selected the most viewed recipes from category - uncategorized . Enjoy the best recipes specially selected for you! 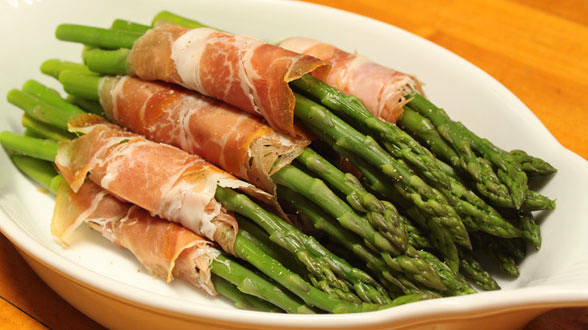 Asparagus with Prosciutto is the right choice that will satisfy all your claims.